When he was 16, Ed Wolak perfected the art of baking hand-cut donuts on the night shift at Dunkin' Donuts. He's been a single-minded brand ambassador ever since. 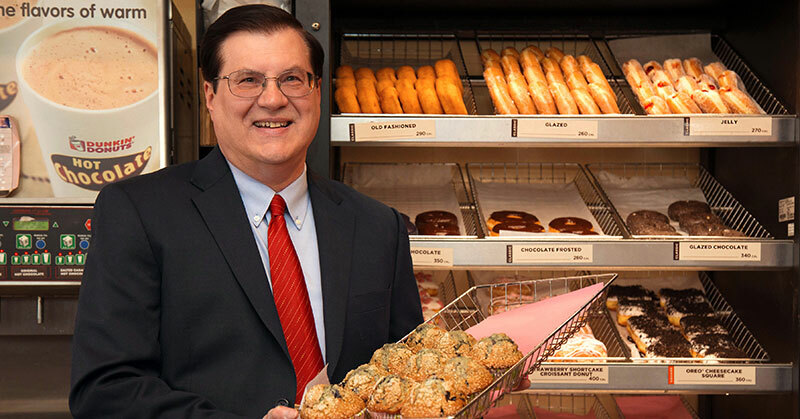 Today, with 42 years of Dunkin' Donuts franchise experience behind him, Wolak, who will open his 100th location in the next year, is a true MVP for Single Brand Leadership. "I believe success within the fast food industry is vastly underestimated and misunderstood," he says. "Franchising with the right brand provides an unparalleled ladder to success. I love the Dunkin' Donuts brand because it has provided me the opportunity to succeed." In return, Wolak, who owns and operates 96 Dunkin' Donuts in Maine, New Hampshire, and New York, has given back to the brand in countless ways over the decades. Since founding The Wolak Group in 1975, he has served as an elected franchisee leader at every level of the brand's advisory system, and has been honored by the brand with its Annual Retail Excellence and Developer of the Year awards. If Dunkin' is pondering a new product, you can bet it's made a test run in The Wolak Group. But don't let his single-mindedness about the brand fool you. Wolak is something of a modern Renaissance man. Along with his philanthropic commitment to the communities he serves, he is a World War II buff, a classic automobile collector, and recently was executive producer of the movie "Sugar Mountain," a thriller set in Alaska, which premiered at the Cannes Film Festival in May. Wolak has taken the initiative to improve both himself and the brand since his high school days, when he started at Dunkin' Donuts washing floors, the lowest paid position on the crew. He quickly assessed all the job and pay levels around him and went to work developing the skills to ensure an opportunity never passed him by. "I took it upon myself to study the Dunkin' training manuals and everything I could learn and read about franchising so I could always put my best foot forward on behalf of the franchise owner and franchisor," he says. Wolak continues thinking big on behalf of the brand and his company. His 2016 goal, he says, is to be known as the "destination employer of choice within the franchise industry where we compete." To help others follow in his footsteps, Wolak has submitted plans to build The Wolak Group Career Development Center in Syracuse, N.Y. The proposed facility will serve as an educational, training, and development pathway to success in the QSR industry. Wolak sees it as a chance to inspire and mentor others to dream big. "Many individuals in today's labor market feel trapped in entry-level positions and view the American Dream as being out of reach," he says. "Going forward we shall make it our mission to demonstrate to every new recruit that no position in our company is out of reach, and that with hard work and dedication to our company, anyone can enjoy a successful and rewarding career with The Wolak Group." My mother worked in Dunkin' Donuts when I was young, so I guess you can say she got me started in the business. I was working for Dunkin' Donuts when I was 16, and Dunkin' has been part of my life ever since. I started out as a porter and eventually worked my way up to being a baker. I put myself through college working 60-plus hours a week and became a manager upon graduation. Before long, I was overseeing multiple stores and soon set my sights on owning my own network. I purchased my first Dunkin' in 1975 and never looked back. The first three units I purchased had been hemorrhaging cash, so I had to learn to squeeze two cents together to make a nickel. I have never forgotten that this is a penny business! Started with nothing and have grown The Wolak Group into 96 locations that employ almost 2,000 people. Thomas Jefferson by Jon Meacham. Management is getting work done through other people. Learn to delegate! Finding the sites that I consider "diamonds in the rough" and turning them into successful Dunkin' Donuts. You can't grow without taking chances and trusting your employees. Put the right people in key positions and let them do their jobs. Labor costs. I take great pride in the number of jobs I have created over the years, especially entry-level positions. I'm afraid that the proposed drastic changes in the minimum wage will lead to a sharp decrease in the number of jobs in the QSR industry, as we are forced to replace employees with machines. As a person who is not afraid to stand up for what I believe in business and in life. We have a rather large and elaborate training department and take pride in the number of long-term employees we have. The substantial number of people who have been with us for 10-plus years demonstrates that we are an employee of choice in our industry. Generally, by number of new stores each year. We will not stop growing and improving. The one thing I know for sure is that in 5 years we will be bigger and we will be better. Our employees are our most important asset and we are constantly working on new and innovative ways to attract and retain employees. We have recently hired a full-time recruiter whose sole job is to work on recruitment and retention. My daughter Kim has recently assumed the role of COO and will eventually take over my role as CEO. My 40-plus years as a successful developer and operator of Dunkin' Donuts restaurants. Throughout most of this time, I have been elected as a representative to the Dunkin' Donuts Brand Advisory Council. I have not been afraid to challenge my managers and reward them when they succeed. Again, this is a penny business. The detailed cost and loss prevention controls we have developed over the years really set us apart from other players in our industry. Never get outworked and you will be successful. The Wolak Group has earned a strong reputation for social responsibility and community involvement. As our business continues to grow, so do our community commitments. We continue to grow existing relationships with local and national charitable organizations, such as the Juvenile Diabetes Research Foundation, the Make-A-Wish Foundation (Central New York and Maine chapters), the Maine State Society for the Protection of Animals, and many more. We have also formed relationships with multiple cutting-edge companies to reduce our carbon footprint, reduce and re-channel our waste stream, and become an innovative "green" and sustainable business. Someone who is a team player willing to roll up their sleeves and work hard, and who accepts responsibility without trying to blame others.